As Christians, we are called to speak. Some of us speak out in our workplaces. Others in our schools or neighborhoods. Our audiences may vary in size, but we are all called to witness to Christ in us. Pastor Mike Baker puts it like this: "Jesus himself has commissioned each of us to be a witness for his kingdom. And every believer has a faith testimony―a story of how Jesus has made all the difference―compelling us to be his representatives." Written in daily devotional style, this book is designed to be an encouragement and support as you identify and add your voice to the chorus. 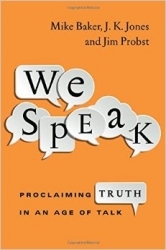 In addition to the chapters by Mike Baker, there are daily devotions by J. K. Jones and a seven-session weekly group study guide by Jim Probst to help you process all that you are learning. Also available is a companion DVD of brief weekly video teachings by all three pastors, which completes this church-wide curriculum series. We live in an age of meaningless chatter. It's time we became speakers of Truth.